For quite some time now I have been seeing Saga in book stores and was intrigued by the covers, yet for some reason I never even bothers to really look at them. 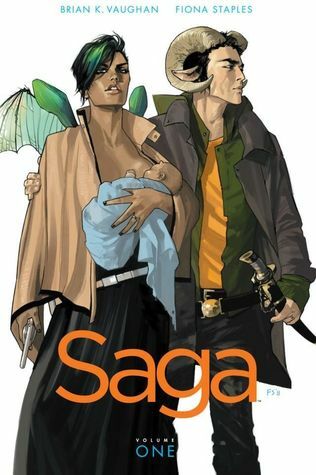 Then more recently, I have been seeing Saga showing up on a lot of blogs and seeing rave reviews about it. Now normally, when I see so many positive reviews on the same book, I tend to ignore that book from then on, because history has taught me that the more positive reviews that surrounds a book the less likely I will enjoy it. But, I also really wanted to check it out. So, I made the snap decision to dive into this series. I was sure enough that I would like it, that I went ahead and bought all of the current volumes, seven in total, and that was one of the best decisions I made. This series is so damn good. I meant to read just one of the books at first, but the next thing you know I had read all seven volumes and was dying for more. The characters, the world building, the story line, everything in it is just so phenomenal. I will admit, that some of the things within the volumes are very strange, and yet they work so perfectly with the book. The artwork in this series is downright gorgeous, and it really helps to truly tell all of the story. I felt so many things reading these books. I felt the joy, sadness, fear, anger and every other emotion of the characters. I cheered them on, I mourned with them. One of the really neat things is how Hazel, the child of the story, is essentially narrating her own story along with the main story. It’s such a neat way to tell things, and adds an extra layer to everything. I have to say that I found Volume 8 to not be as strong as the previous volumes. It was still really good, but felt more like a side story that the main story arc I had come to know and love. I can’t really go into too much more detail, because I don’t want to spoil anything for anyone who hasn’t read this series yet. But I will say that I’m glad that I finally read this one, and in a way, I’m glad that I waited so long, because I was able to get through seven volumes in one go. 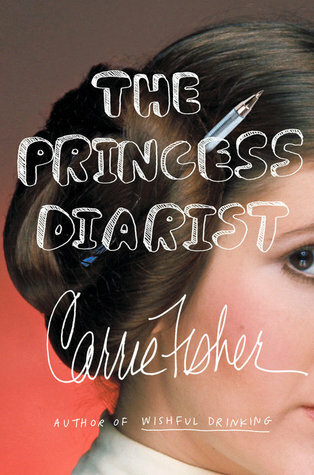 I have a feeling I will be rereading this series countless times because it is so darn good. If you have been thinking about reading this series, I would highly suggest that you go do so. Really looking forward to continuing with this series as each new volume is released. This entry was posted in Books, Fantasy, Graphic Novel, Romance, Science Fiction and tagged Book Review, Books, Fantasy, Graphic Novel, Romance, Science Fiction. Bookmark the permalink.